I am so happy. I made it through day one with no cheating. Well, I did take a sip of my husband's coke. Only one though. Then I faithfully drank water and fruit water the rest of the day. Eat with me today as we begin cholesterol lowering diet 2. Today was a good day. Hopefully my choices will help lower cholesterol. I had a yummy smoothie for breakfast, a colorful salad for lunch and my favorite fish for dinner. My diet is so healthy. I can't believe it took me so many years to discover that eating healthy is the only way to be truly healthy. 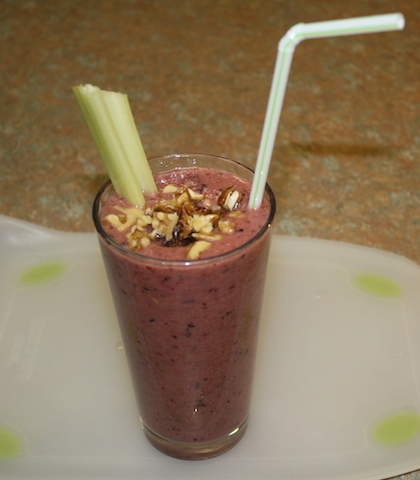 For cholesterol lowering diet 2 have a tasty walnut topped smoothie. 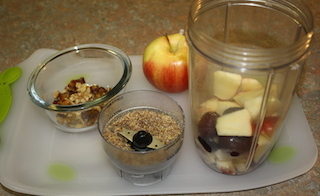 In a blender container put: a small banana, a few cherries and about half an apple. gala is good. Add about ten green and ten black grapes. On the left is the topping of chopped walnuts and dates. Add 1 tablespoon chia seeds. They are good for lowering cholesterol. If you add flax seeds, they should be ground first. Add water as desired. Then blend until the mixture is the consistency you like. I put my chopped dates and walnuts on top and added a celery stick. I use the celery like a spoon. Stir, scoop, bite. Very tasty. I made this in my bullet and it was just the right amount for one person or one and 1/2 if there is someone little at your house. This is a quick easy lunch. 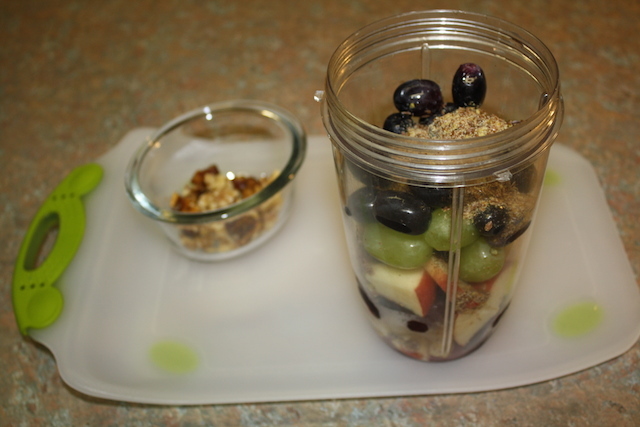 Add a piece of sprouted grain toast and a big glass of homemade fruit water. Yummmy. I made this in a 2 quart bowl. 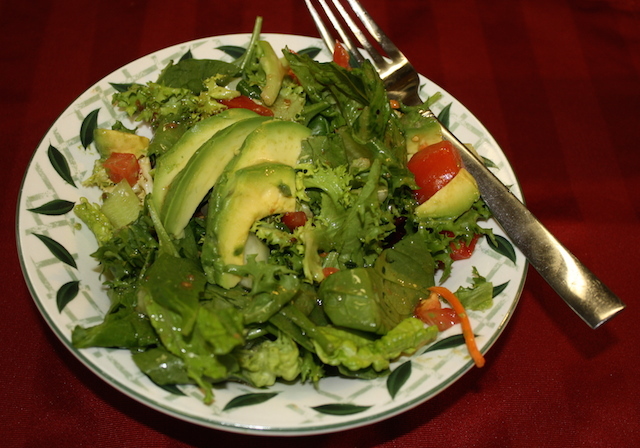 You need about half a bag of field greens Add one chopped avocado (save a little for garnish), one chopped tomato, 1/2 a cucumber (chopped), some onion, a handful of spinach and a stalk of celery. Drizzle on some Bragg ginger dressing and there it is. Easy, delicious and enough for two--unless of course you are very hungry. If this was an evening meal, I might add some chopped roasted chicken (not canned though). Never ever ever use lunch meat. Okay, that is not too beautiful, but it was quite tasty. 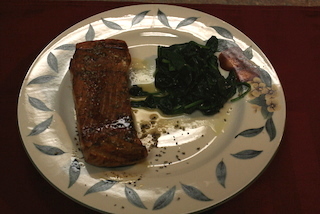 Baked salmon and steamed spinach. It is so easy to bake salmon. Leave on stove just until hot. Put salmon on a sprayed cookie sheet. At beginning and every five minutes afterward, brush on sauce. It only takes about 15 to 20 minutes depending on the size of your fish. Let everyone add salt and pepper as they desire. The spinach was steamed lightly. I removed it from the pan and added olive oil and a small amount butter and sea salt. The meal was fast and easy. My family will eat this. Well, Jared is fourteen and he won't eat spinach. I guess I won't tell him about all the spinach he has had in smoothies. "Eat fish often, it is tasty and a good source of protein." "Be active, be healthy, be happy."